Witnesses Offer Graphic Testimony In Child Abuse Case | NOT IN MY WORLD!!!! Photos that are states evidence of Child with over 40 broken bones. 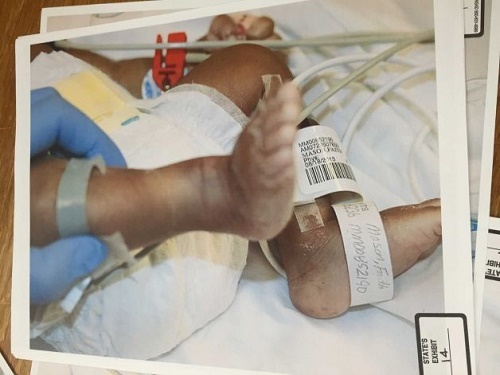 Beaumont, TX – Witnesses in the criminal trial of a Port Arthur woman accused of severely injuring her newborn baby testified dozens of times Tuesday that it was the worst case of child abuse they had ever seen. Christine Johnson, a Port Arthur woman accused of breaking or fracturing 40 of her newborn daughter’s bones in August 2013, is charged with two counts of injury to a child. If convicted, the 22-year-old faces life in prison. “Every time you grabbed something, it was broken,” said Angela Webb, a registered nurse who worked at Christus St. Mary Hospital, where Faith Mason was admitted on Aug. 18, 2013. Webb sobbed on the stand as Assistant District Attorney Pat Knauth asked her to explain photos of Baby Faith’s injuries. Johnson is accused of yanking the 1-month-old out of her bassinet by her arms on Aug. 13, 2013. The force caused the baby’s neck to break and damaged her brain, according a probable cause affidavit in the case. An investigator with Child Protective Services testified that Johnson told her she grabbed the girl so violently because she cried and woke her up. Johnson was arrested about a month after the emergency room visit. She and Faith’s father, Darrell Mason, 19, lost custody of their daughter around the same time. Mason is also charged with injury to a child. He will be tried separately at a later date. Faith Mason, now 2, remains in state care. Ryan Matuska, Johnson’s attorney, asked all of the state’s witnesses if they could say precisely what caused the girl’s injuries. They all testified that they could not. Dr. Peter Evans, St. Mary’s emergency room medical director, said Faith’s injuries were so severe that they were comparable to a fall from a two-story building or a severe car crash. “Her femur was completely deformed,” he testified. Matuska said in his opening statement Tuesday morning that Faith’s injuries were undeniable. But who caused the injuries was unclear, he told the jury. “I ask you to keep an open mind,” Matuska said. Testimony will resume in Stevens’ court today. Previous PostSiblings Of Child Abuse Victim AdoptedNext PostCPS INTENTIONALLY TAINTING NUMBERS!!! !